2 curved, acid-etched glass panels – 1 gray, 1 clear. White painted metal structure and brass mounts. 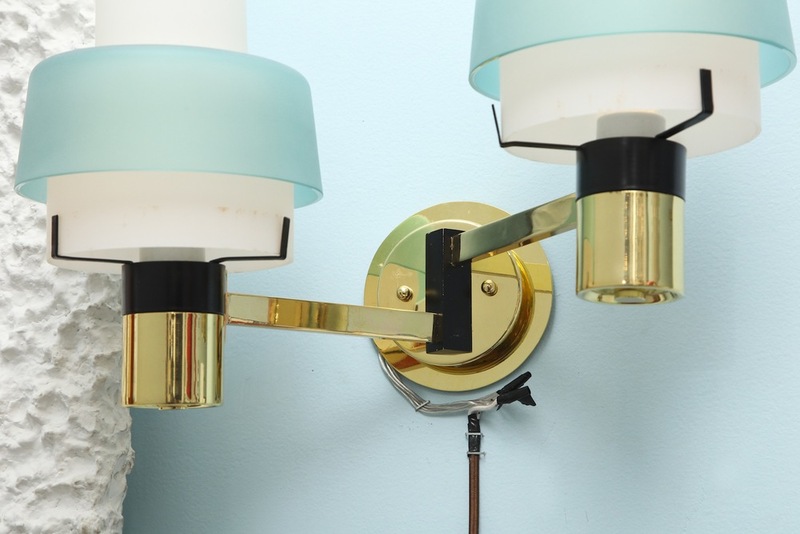 Each sconce has 2 candelabra sockets. Very good original condition with new wiring & sockets. 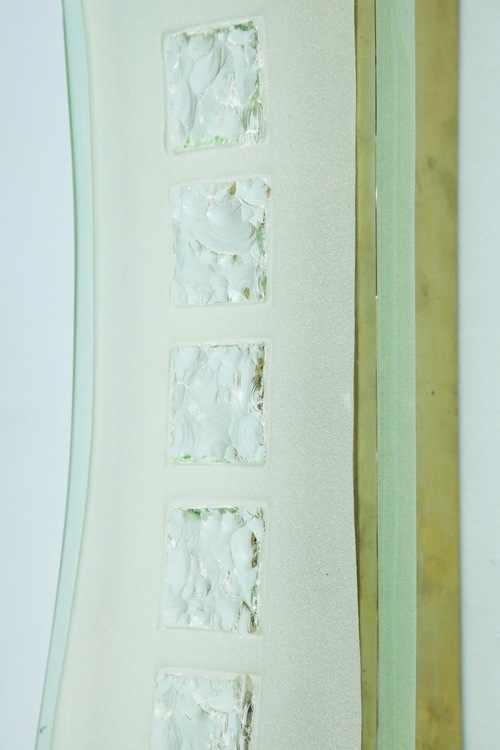 Contemporary sconces, handmade per order in France. 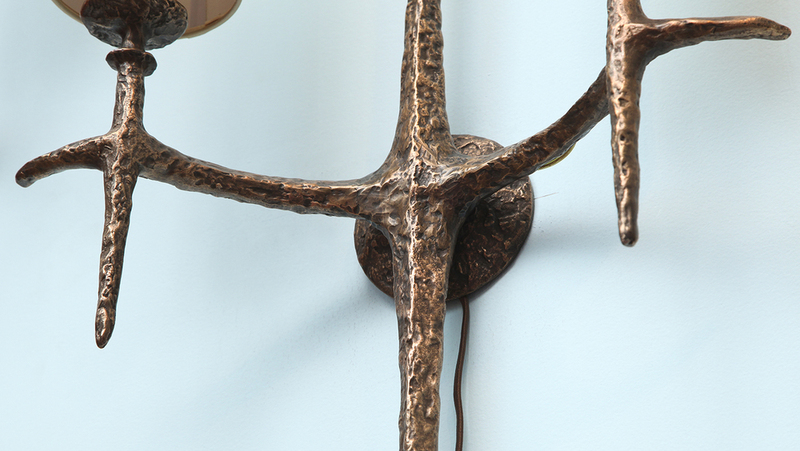 Anatomically-inspired form in polished bronze with hand applied patina. Two candelabra sockets, & paper shade. Lead time is 12-15 weeks. h. 36" w. 18.5" d. 7.5"
Great forms of black painted and polished brass. 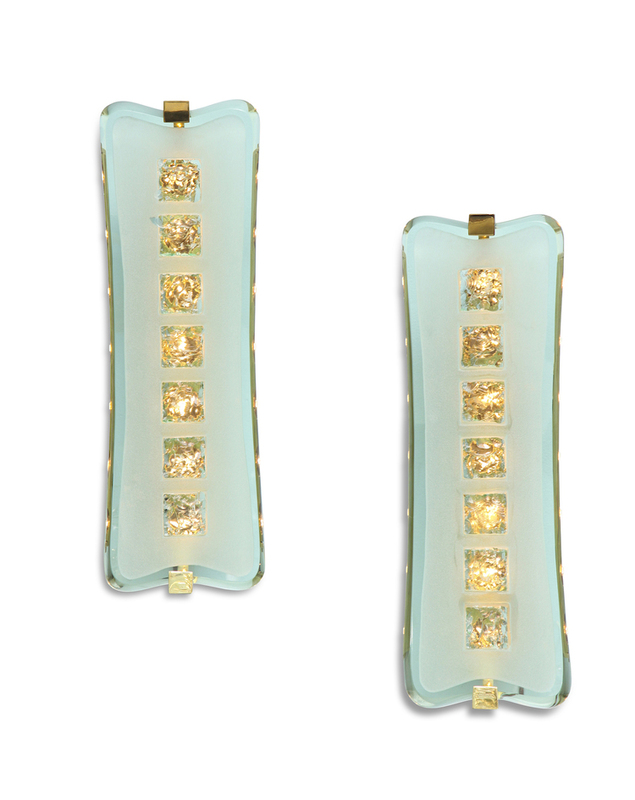 Acid-etched, white-glass reflectors with pale blue, frosted-glass shades. 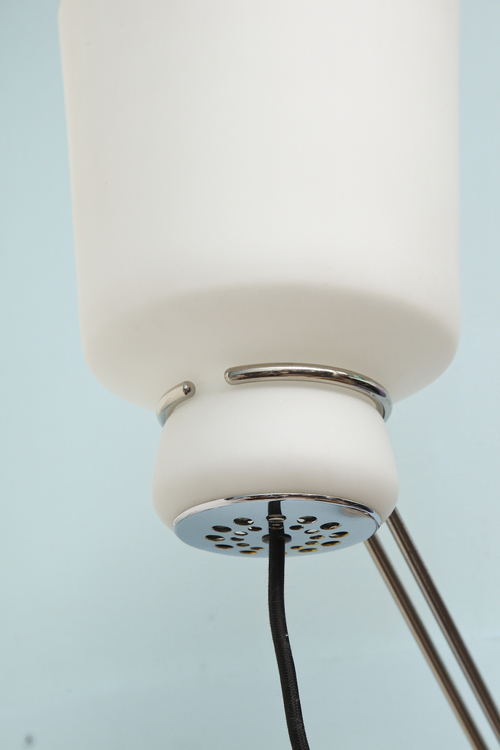 Each sconce has two edison sockets. h. 13" w. 17" d. 9.5"
Good condition. Some staining to glass and some age to metal parts. Black enameled steel frames with aluminum caps. 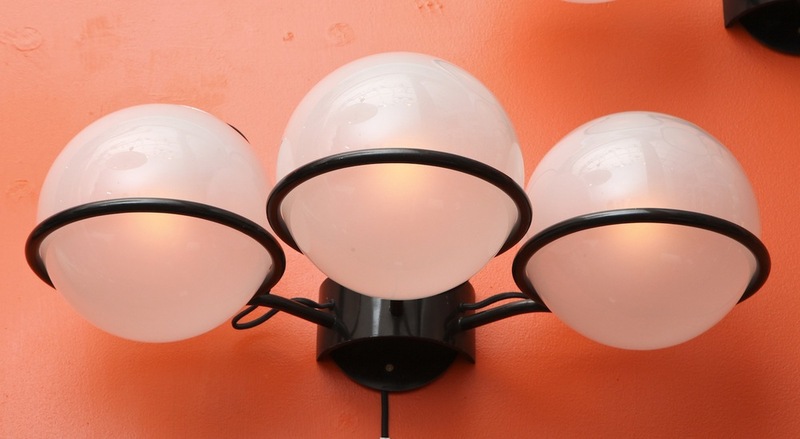 Smoked glass globes and Edison sockets. Newly created circular mounting plates, and new wiring. Literature: Romanelli & Severi. "Gino Sarfatti: Opere Scelte 1938-1973 Selected Works". Pg. 415. Large slabs of thick, curved crystal with beveled sides. 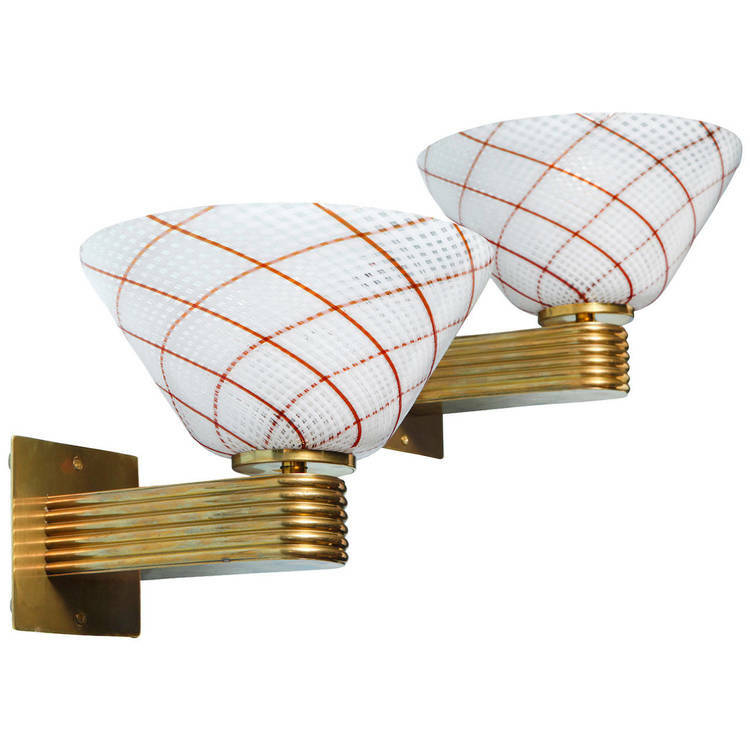 Etched squares with chipped centers run down the middle of each sconce. 7 candelabra sockets. An unusual & extraordinary example of glass manipulation & craftsmanship, with entirely brass body and mounts. 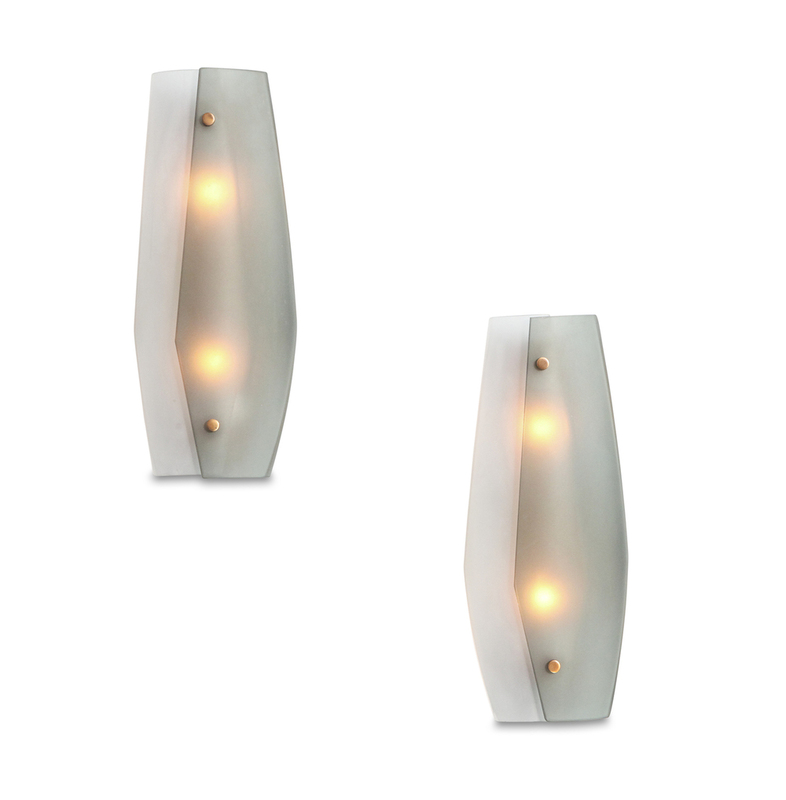 These sconces are a significant Ingrand model. h. 24" w. 8.5" d. 4.5"
Excellent condition. Expected wear to brass and glass shows signs of age. Wiring and sockets are new. Channeled brass arms supporting conical cups of Filigrana glass with red and white canes. Newly made back plates, and recently wired. 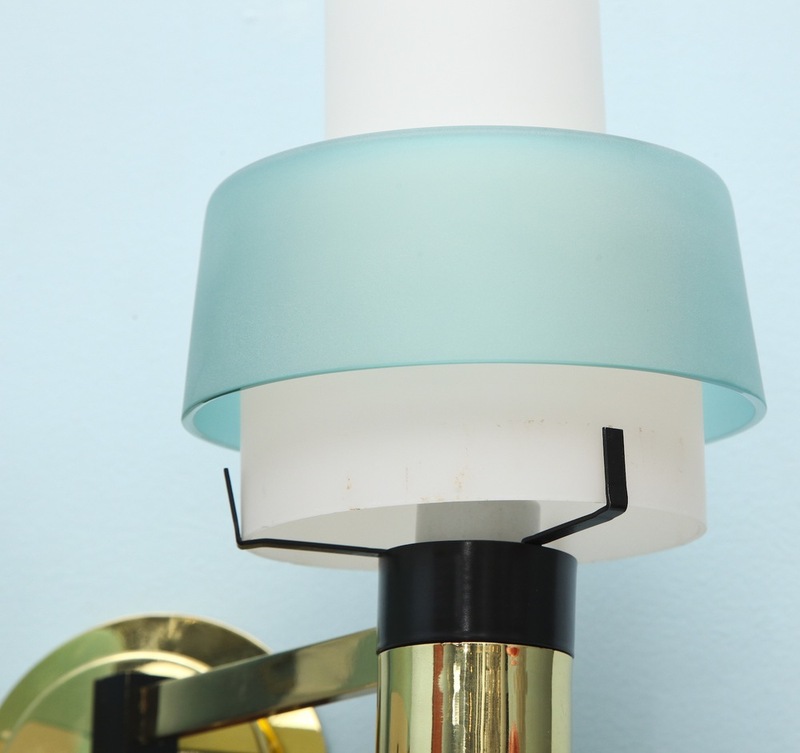 Each sconce has one edison socket. 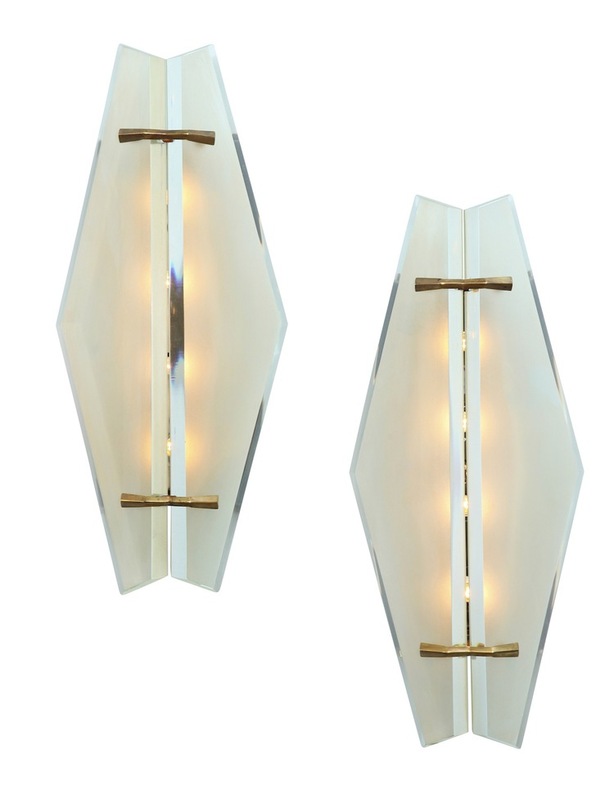 h. 7.5" w. 8" d. 10"
Limited edition sconces of nickeled bronze with carved alabaster reflectors. This edition will have 50 pieces. Each piece is signed and numbered. The name refers to a tribe in the South Pacific whose decorative objects inspired the design. 12–15 week lead-time required. h. 18" w. 8.5" d. 3"
Elegant, shaped crystal with concave, frosted centers. Brass mounts. Model #2093 in Fontana Arte catalog. h. 8.5" w. 4.5" d. 5.75"
Excellent condition. New wiring and sockets. 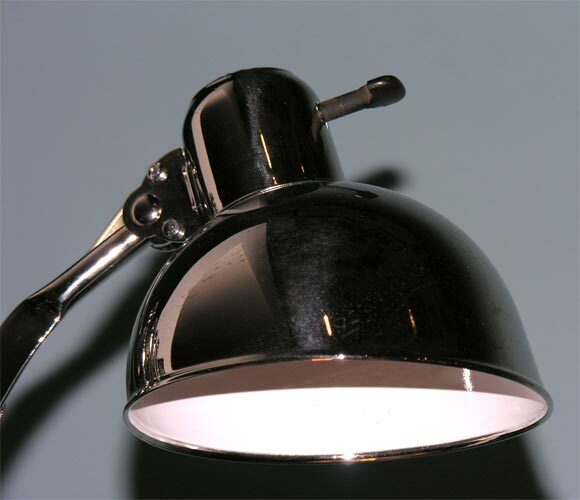 Backplates are not original to the piece and have been recently created to US lighting standards. Model #1937, featuring thick crystal shields with beveled edges and satin faces. Black metal and steel structures with patinated brass clips. Although this model was originally shown by Fontana Arte as a ceiling light, it is perfectly suited to be used as wall sconces as well. h. 22" w. 10" d. 5.5"
Excellent original condition with new wiring and sockets. Christian Dell for Kaiser & Co., Model #6718. 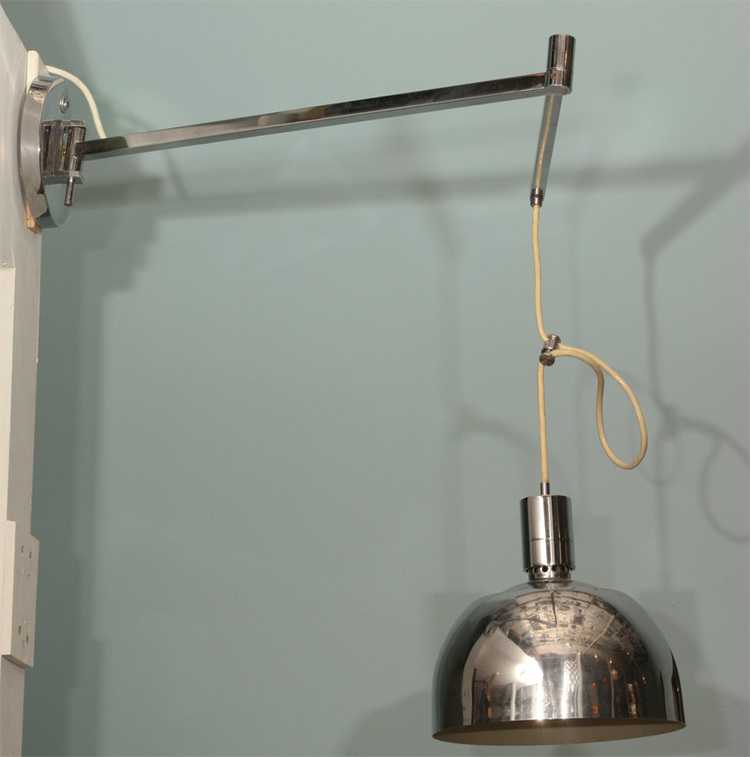 Wall-mounted lamp of polished nickel with extending gate-fold mechanism, with original bakelite switch. w. 35.5" (fully extended) diam. 6.5"
Excellent condition. Fully restored and rewired. 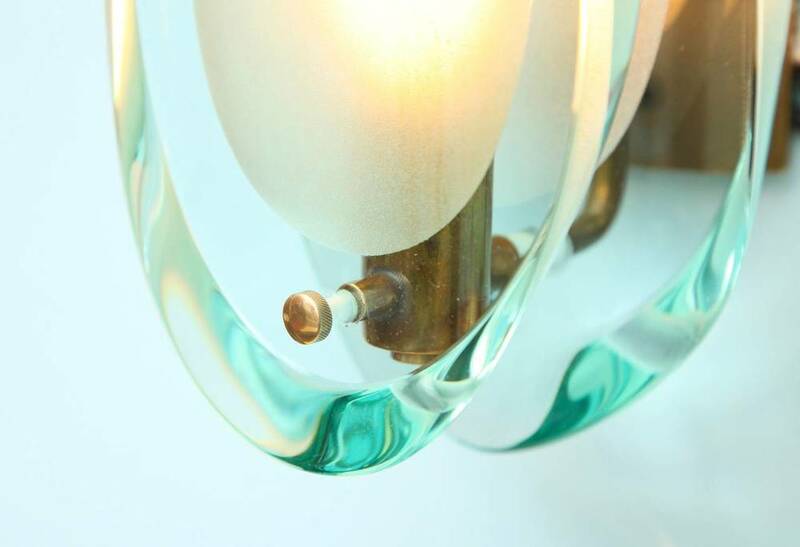 Rare model with brass structures and conical shaped satin-glass diffusers. Newly made back-plates. h. 17" w. 2" d. 5"
Excellent Condition. Glass has no chips, cracks or scratches. Metal has oxidized unevenly in some spots. Newly wired for US standards. 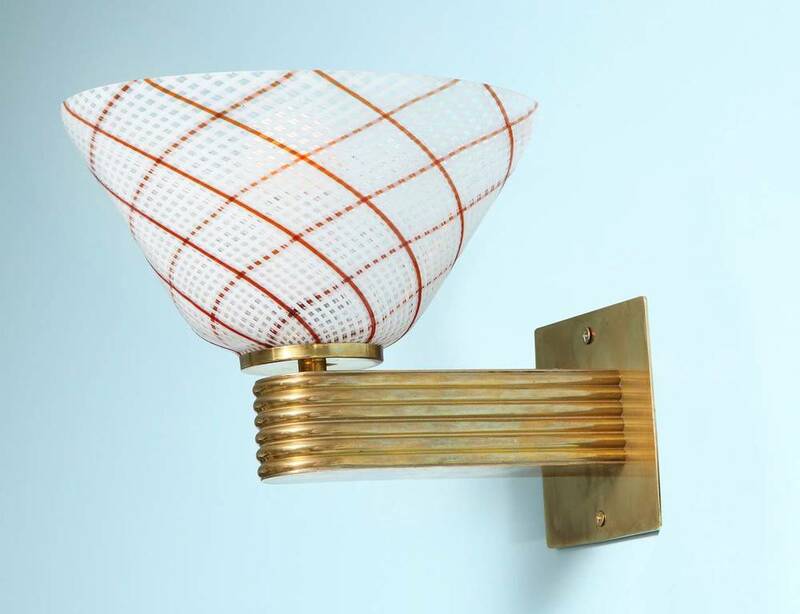 Completely handmade fixture of polished brass & painted aluminum shades. 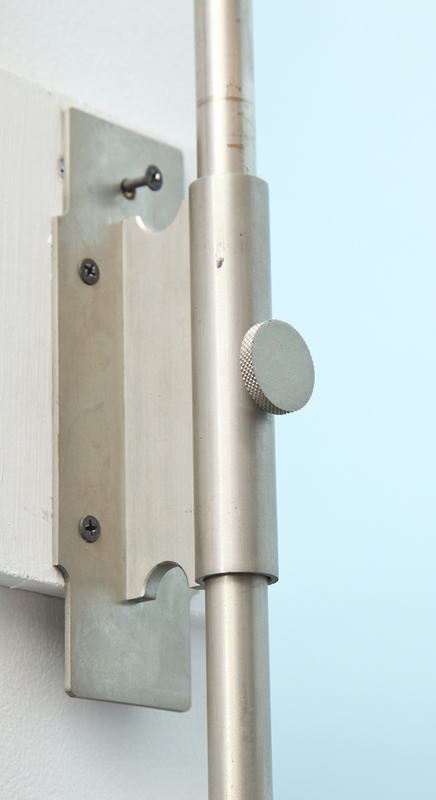 A unique system allows each arm to adjust its positioning at the base & every shade pivots up and down. This piece is made per order in Italy and requires a 12-15 week lead time. 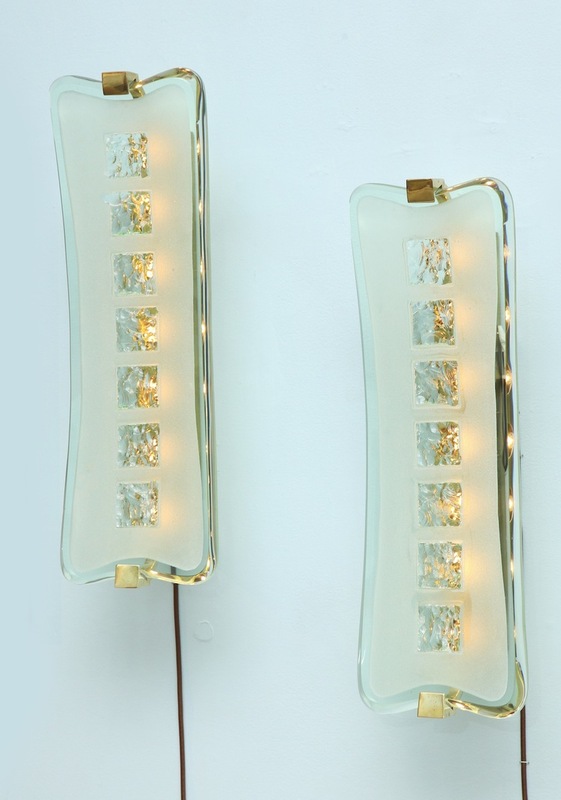 h. 52" w. 72" d. 38"
Mirrored back plates with brass mounts and front reflectors of etched & frosted glass. Great early design with decorative motif. h. 14" w. 7.5" d. 8"
Very good original condition with new wiring. 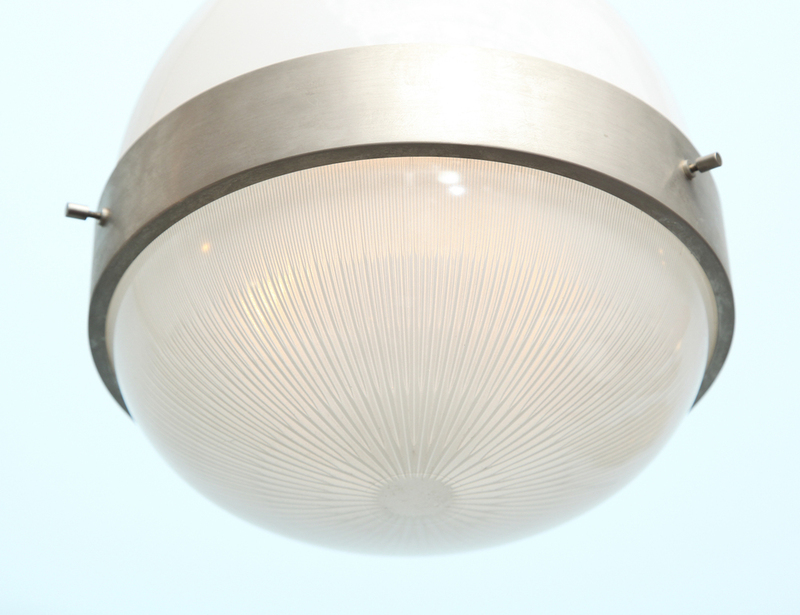 Chromed steel & polished aluminum structures supporting large frosted glass shades. One edison socket per sconce. Signed with manufacturer's sticker. 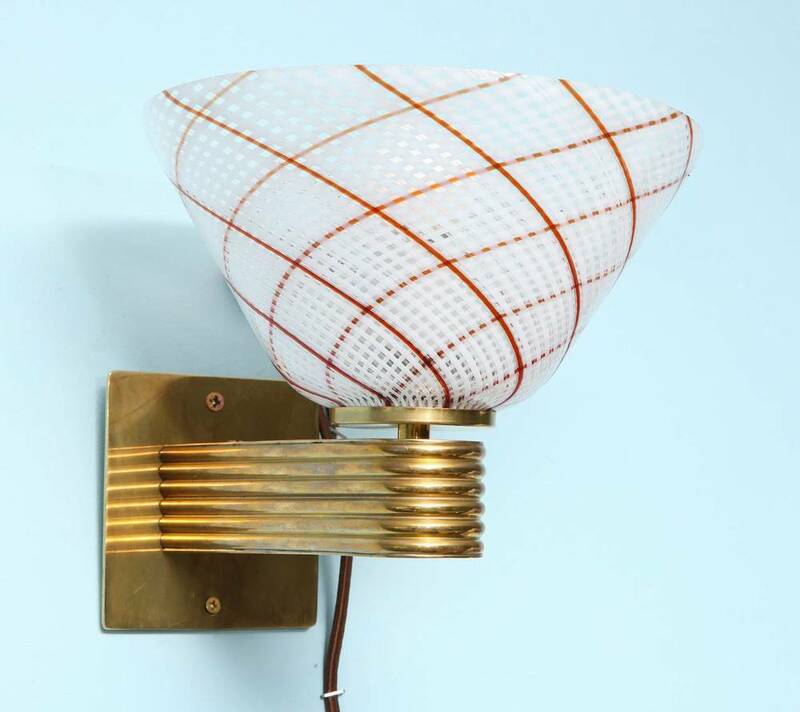 The design of these sconces is attributed to the architectural duo of Carlo Santi & Vittorio Borachia based on other very similar pieces they did. h. 17.5" w. 8" d. 12"
Excellent condition. Metal has been recently polished out and shows only minimal signs of age. 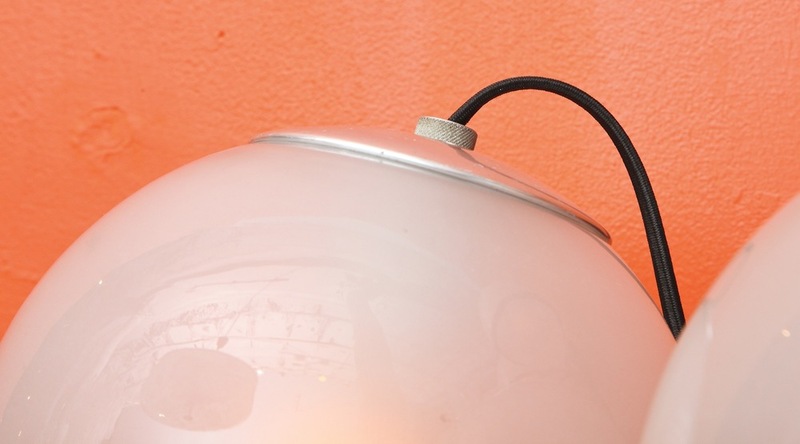 Glass has no chips or significant scratches, and wiring and sockets have all been recently replaced. An early Mazza piece, produced by Artimede. 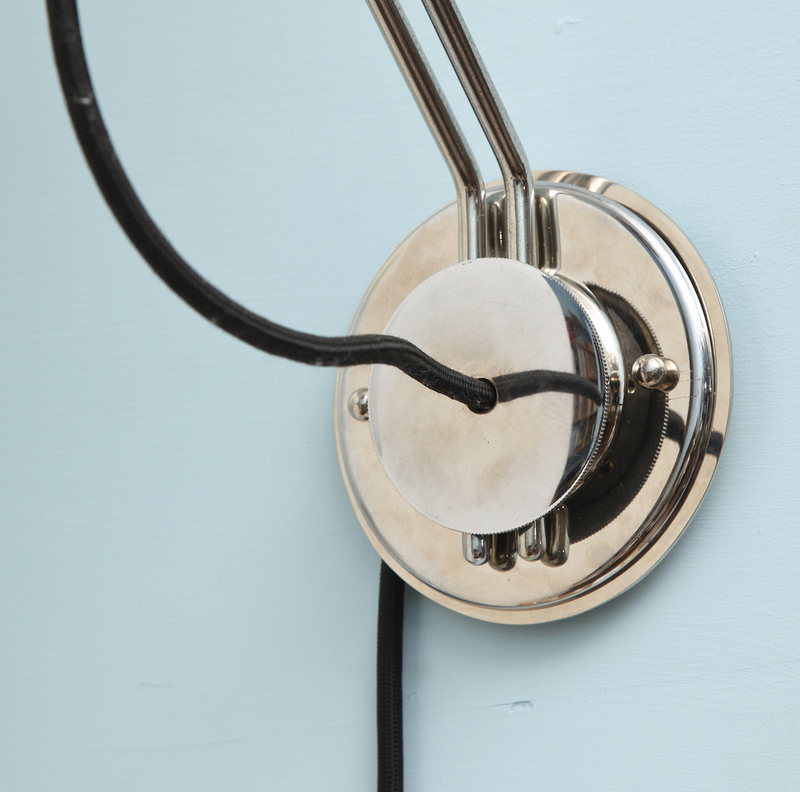 Wall-mounted fixture of brushed nickel. 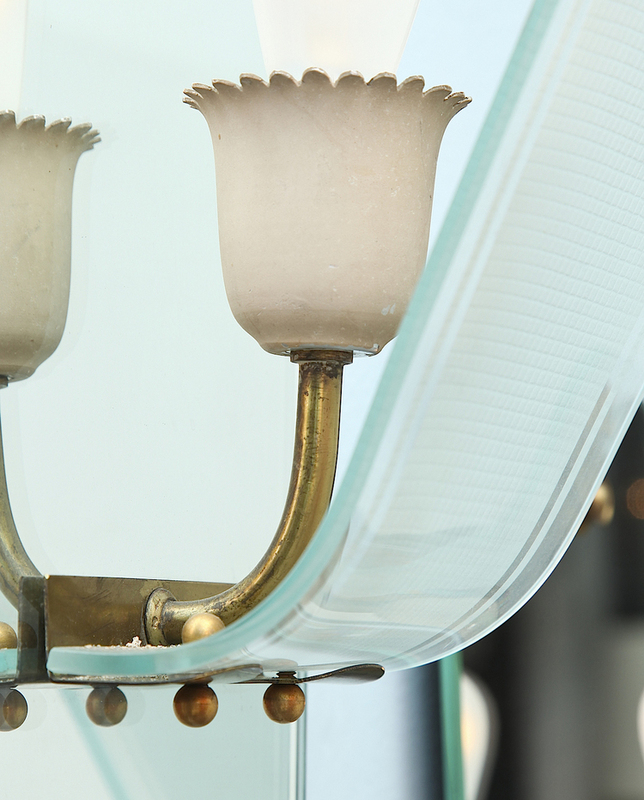 Adjustable arm with white opaline & ribbed glass. *Second matching light available. Excellent condition. Recently cleaned and rewired. 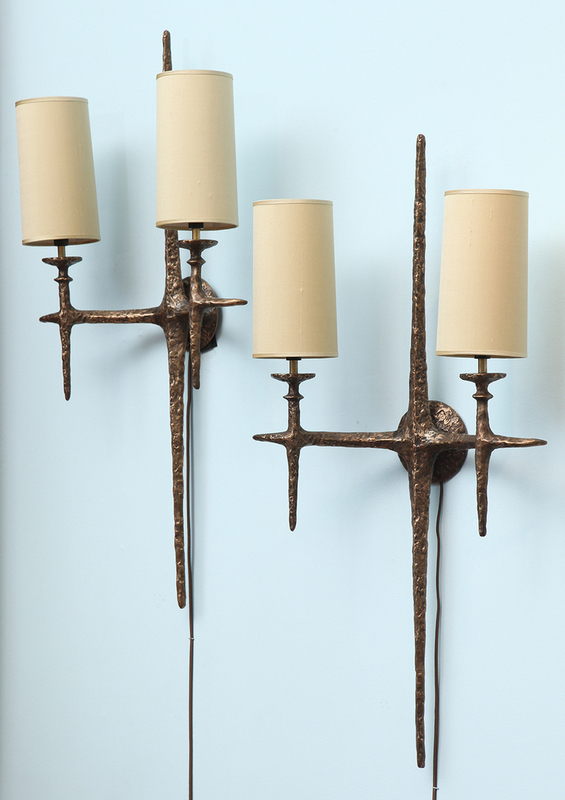 Textured bronze sconces in crucifix form, with sculptural detailing. Textured silk shades. 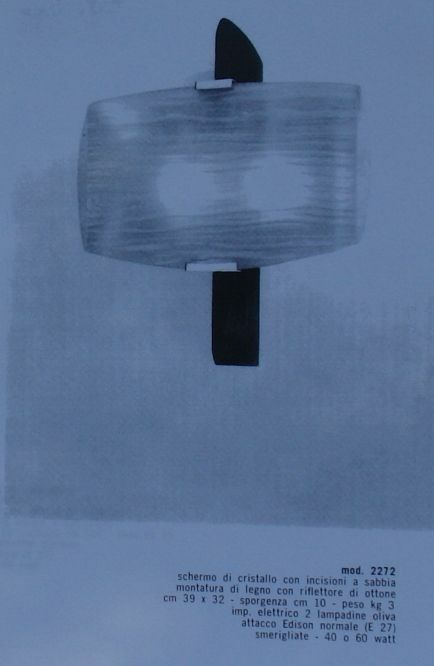 These sconces are now being produced with custom mounting plate that matches fixture, see images 6 & 7. Also can be ordered in custom 3-light version. Lead time: 12 to 15 weeks. 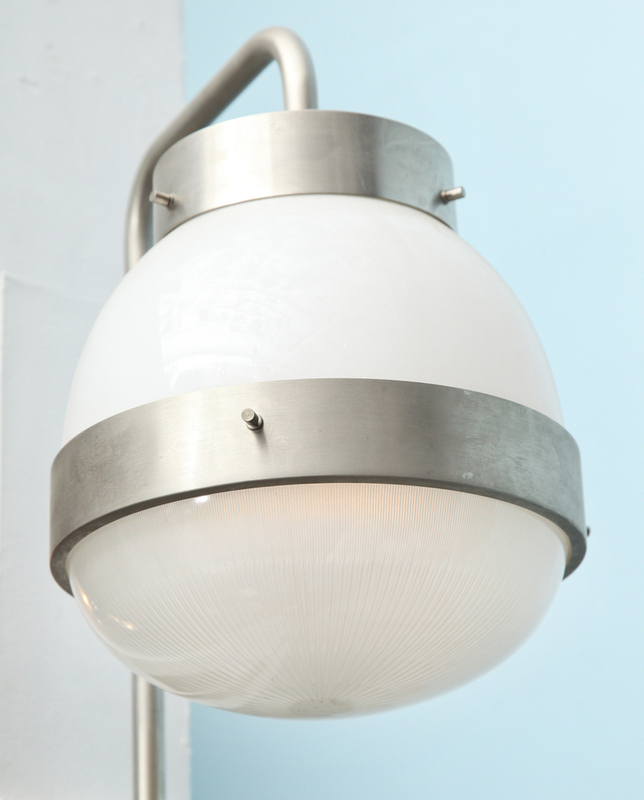 h. 36" w. 19" d. 7.5"
Single metal sconce with chrome finish. 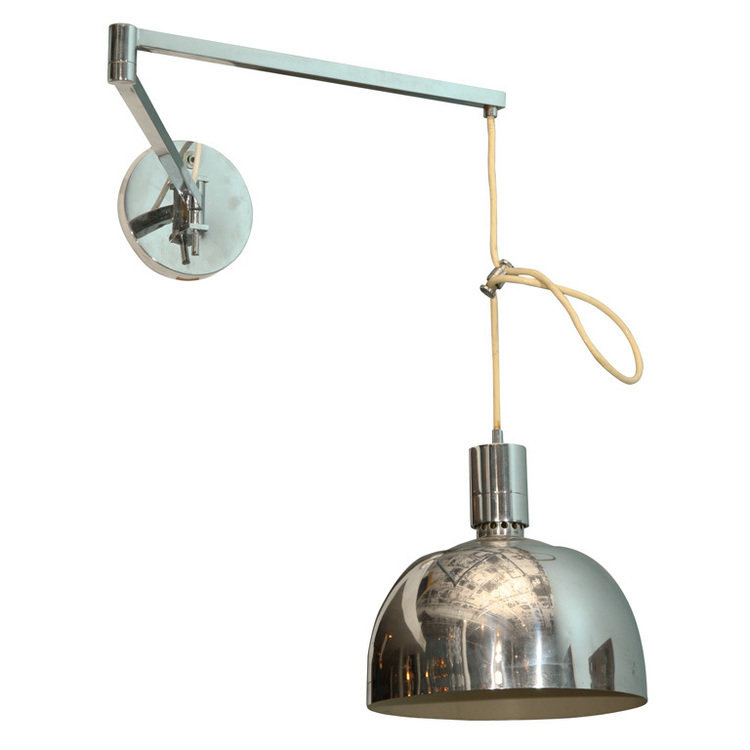 Swinging arm and suspended shade with adjustable height. 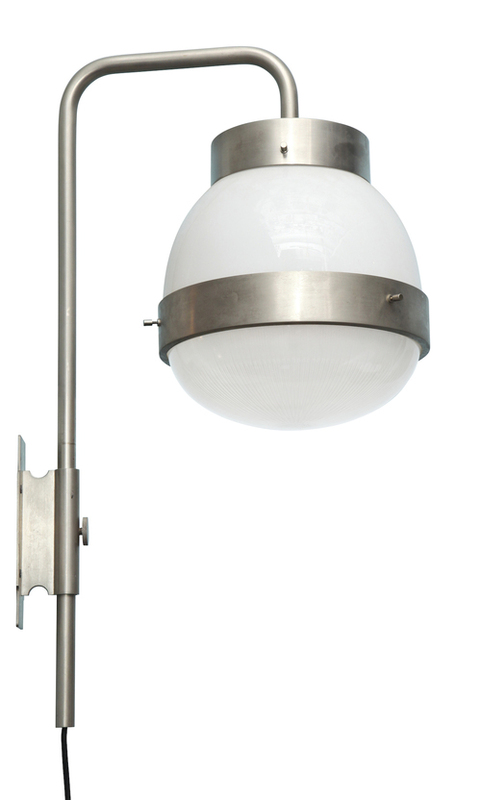 *From the five-lamp AM/AS series that included hanging fixtures, table and floor lamps. h. 35" w. 30" d. 12"
Plaster sconces formed in the shape of a cluster of cones in various sizes. Light source in each cone. 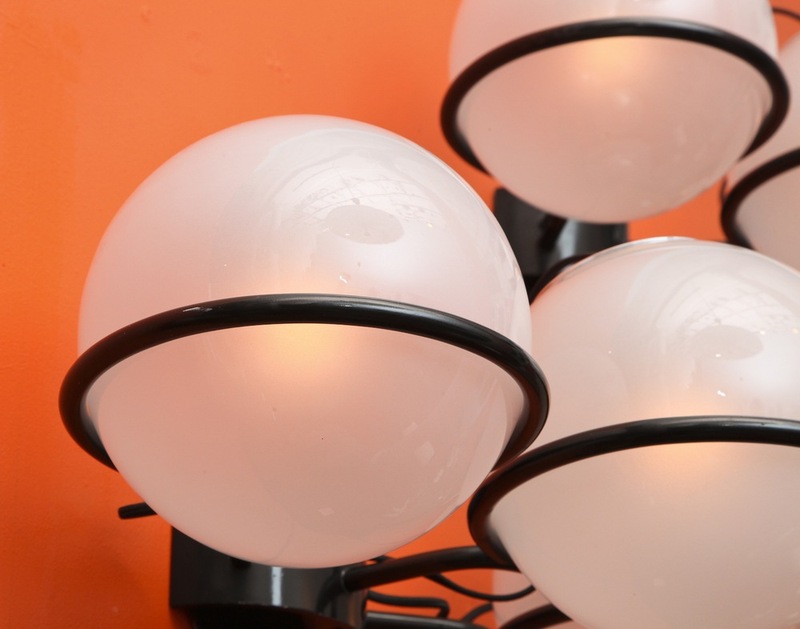 *These lights are made per order by the artist and are available only through Donzella. Lead time: 12 to 15 weeks. h. 18" w. 21" d. 8.5"
Rich, wooden column support with brass reflector back plate. Sandblasted crystal front piece in relief. A very rare model, #2272.
h. 15" w. 12.5" d. 4"